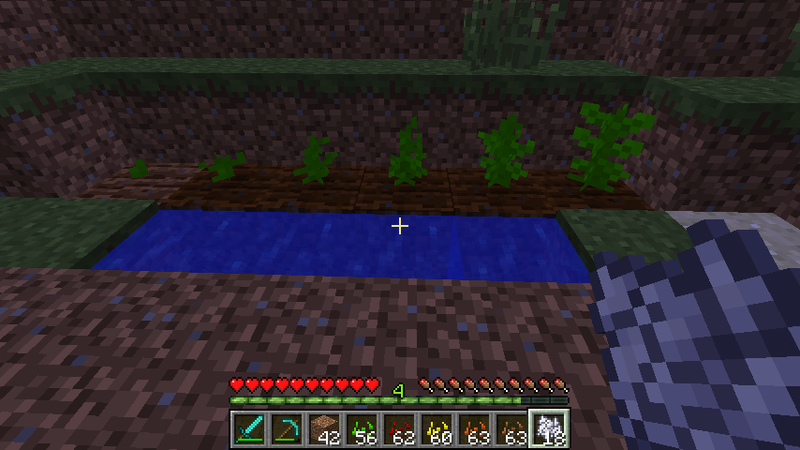 apple trees can be planted on dirt and grass blocks, apple trees have 6 growing stages and need a light level of 9 or higher to grow, when fully grown apple trees drop apples over time. 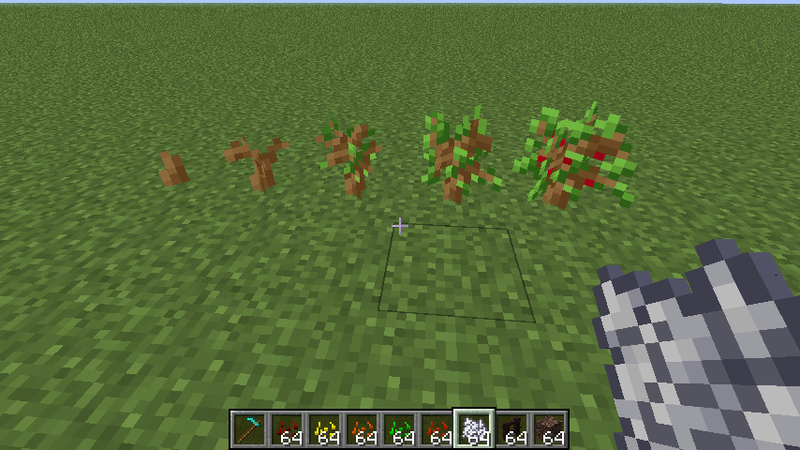 Can be found on forest biomes. 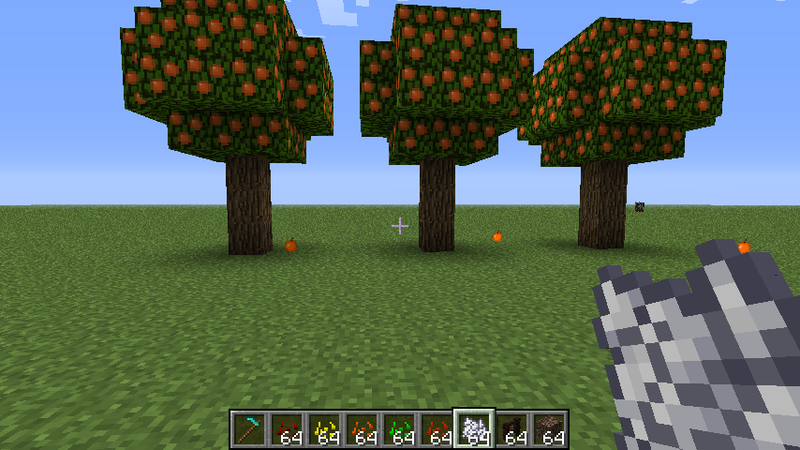 orange trees can be planted on dirt and grass blocks, orange trees have 6 growing stages and need a light level of 9 or higher to grow, when fully grown orange trees drop oranges over time. 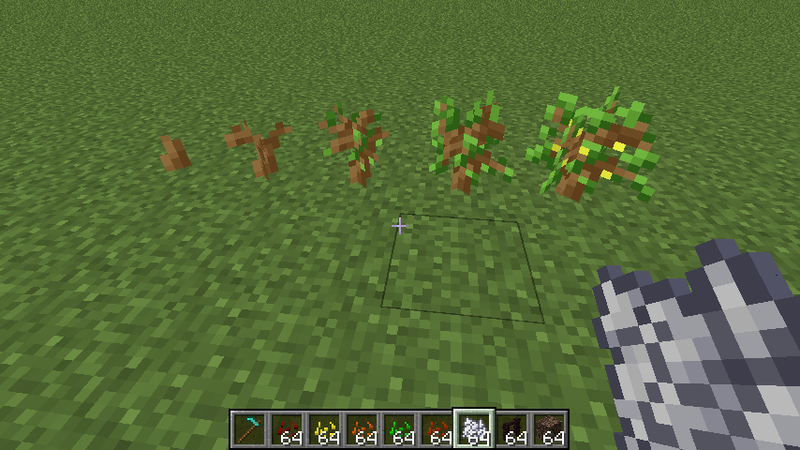 Can be found on forest biomes. 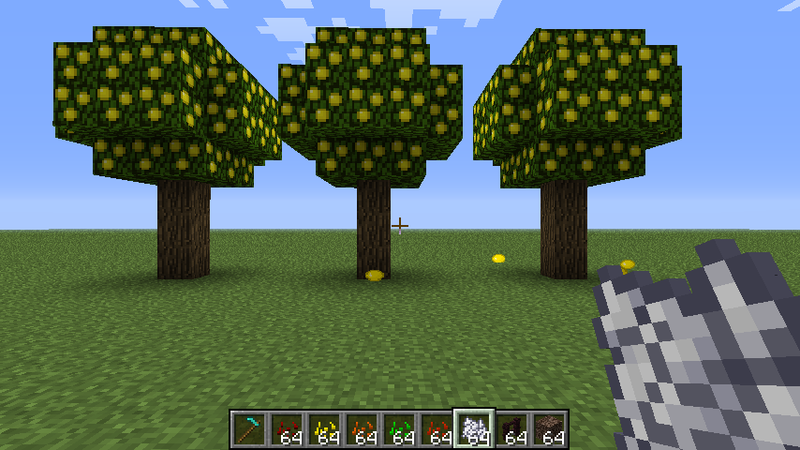 lemon trees can be planted on dirt and grass blocks, lemon trees have 6 growing stages and need a light level of 9 or higher to grow, when fully grown lemon trees drop lemons over time. 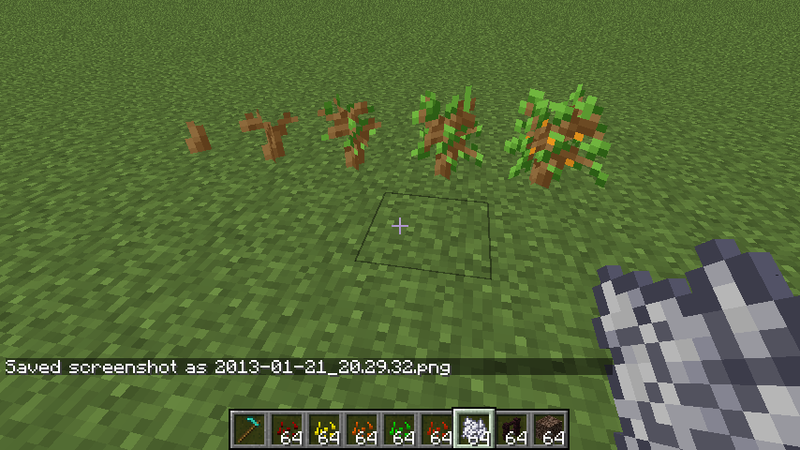 Can be found on forest biomes. mint plant can be planted on farmland only, mint plants have 6 growing stages when fully grown they drop mint and some mint seeds. 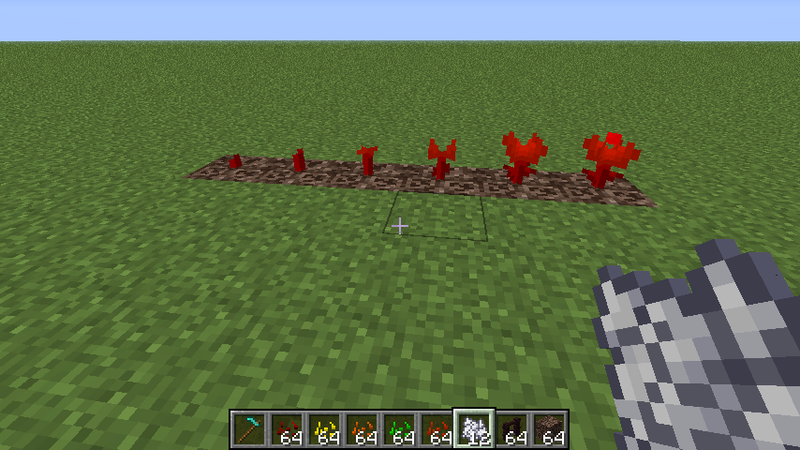 nether flowers can be planted on soulsand only, they have 6 growing stages and drop blaze powder and some seeds when fully grown. 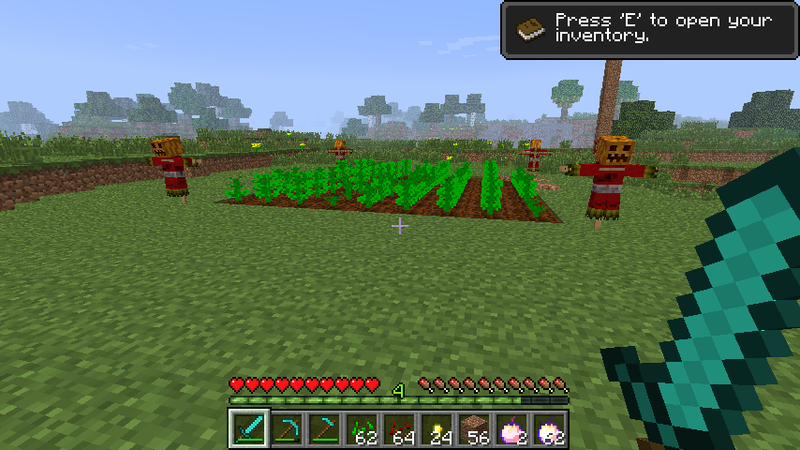 They can be found on the nether. the rake is a tool similar to the hoe but can only be used on grass, when you use the rake on a grass block it turn it into dirt an have a chance of droping a seed(apple seeds,Orange seeds,lemon seeds,cocoa seeds, mint seeds, melon seeds and pumpking seeds), the better the rake the better chance of getting seeds(gold has the higher chance). chocolate bar its a food item that heals 2 hunger. its the same that chocolate bar but instead of hunger it heal 2 hearts and max stack size is 16.
heals 1 hunger instantly(no animation). obtained by right clicling a cow with an empty bottle, milk bottles cures poison. heals 4 Hearts and have a max stack size of 16.
heals 2 hunger and gives Strength for 30 seconds. heals 2 hunger and gives Water Breathing for 30 seconds. scares animals within 5 blocks. how it works instant grow or per stages grow(instantGrow), 0 means off and 1 means on. 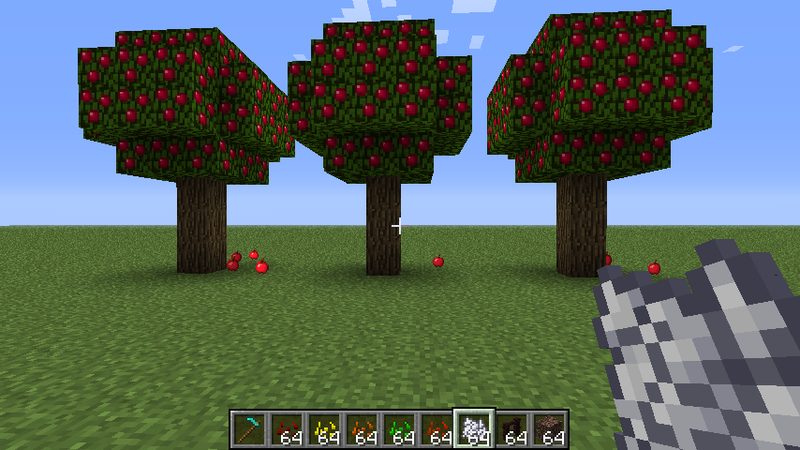 when a fruit tree drops a fruit his leaves have a 1/3 chances of becoming a normal leave that dont drop fuits, this feature is on by default but you can turn it off on the config file(leaveDecay). Note: you can change ids and heal values using the BF.cfg file on the config folder (Server Config is on the config folder on the server directory). -then put the .zip on the mods folder. Good mod, please make it for 1.6.4, i need it to my modpack. need for minecraft 1.8 pleace!! Can you change the textures for the chocolate bar 'cause they look kinda wierd. No offense, great mod though! This is nice mod. Downlading now. can you please link me to a download for Forge on a mac? for the bukkit server? 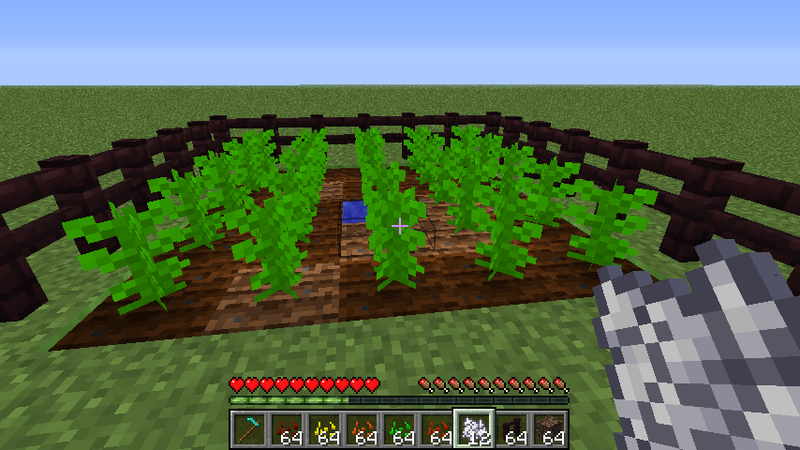 Also, lemon trees are usualy not that large. Neither are orange trees. 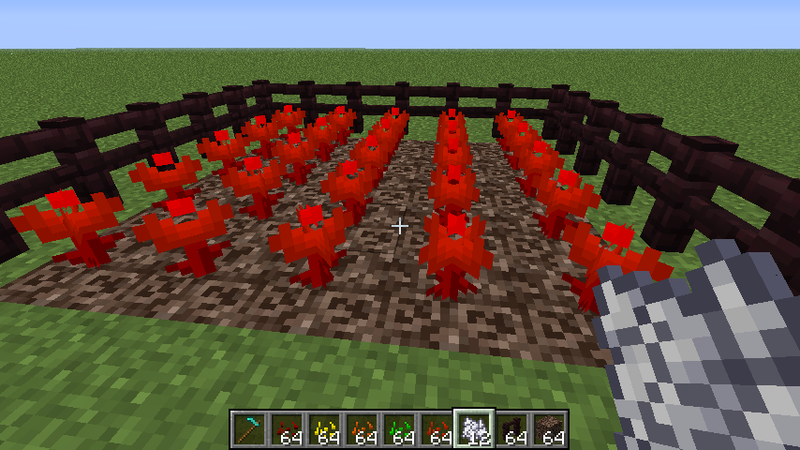 The blaze powder from the Nether Flowers is, i think, just a little to much. Blaze powder is rare, but with the flowers, it is becoming a little to common. Everything else i love though. This is fantastic, but maybe some more kinds of tea, rather than just mint tea.